The Secret Service has released a walking map with routes designated for pedestrians during the weekend of the Papal Visit September 26th and 27th. 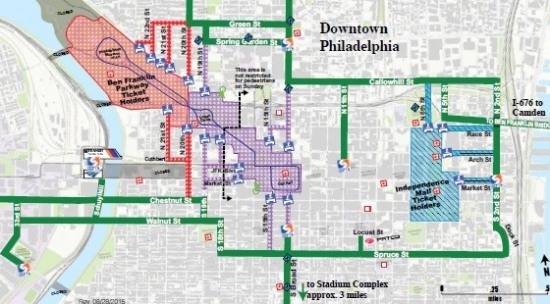 The map also indicates the secure areas and entry check points where pedestrians will be screened at both Independence Hall and the Benjamin Franklin Parkway. The areas in front of Independence Hall and immediately around the Art Museum will require tickets that are being distributed by the World Meeting of Families to the area's 219 parishes. Note the scale of the map, river to river is approximately 2 miles. The locations of 40 Jumbotrons are also on the map. These Jumbotrons will show everything that Pope Francis does while in Philadelphia including his airport arrival, mass at the Basilica, arrival at the seminary, his prison visit, address to bishops, and departure. You'll see it all. The Secret Service has also released a list of prohibited items within the secure zones. The obvious items include things like mace, weapons, ammunition, explosives, and more. You also cannot bring balloons, selfie sticks, coolers, glass/thermal/metal containers, aerosols, animals (unless service), drones, or bikes (inside the fence). You can bring a small backpack (18” x 13” x 7”), small signs (5' x 3' x 1/4”), water and food. If you have a problem with any of that, then don't go inside the restricted zone. It's not that big, just the width of the Parkway. The full list is below. Look at the map here. A North Penn graduate is under arrest for allegedly sharing explicit photos of underage female classmates. 18-year-old Brandon Berlin of Montgomery Township is accused of collecting images of the girls in various stages of undress in a Dropbox account and then sharing a link to that file-sharing site for others to see. He received many of the photos from friends who could have been charged under the sexting statute, but Montgomery County DA Risa Ferman said ultimately he was the one that compiled them all and shared them on a mass scale. The investigation began in March when a female student discovered the link on her ex-boyfriend's computer and contacted police. He is charged with a misdemeanor of Transmission of Sexually Explicit Images by a Minor as he was 17 when he first started compiling the images, but it has been certified into adult court. His bail is set at $10,000 unsecured. A Delaware County man has been arrested after he was caught on surveillance cameras stealing a USO charity jar from a Wawa in Glenolden last Tuesday. 48-year-old David Melanchuck from Clifton Heights paced around the store for a long time before going for the plastic box which contained around $50. Glenolden police released his picture this morning and within a few hours they had enough tips to find Melanchuck and make an arrest. He was charged with theft and released on his own recognizance. Papal Visit Secure Area Restricted items. Look at the larger map here.